from 3 pcs. 4,42 EUR ea. from 10 pcs. 3,96 EUR ea. from 40 pcs. 3,53 EUR ea. from 80 pcs. 3,34 EUR ea. 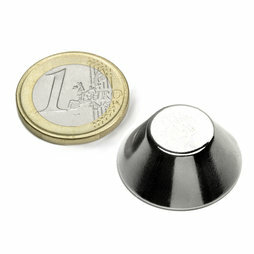 These cone magnets are neodymium magnets with special features: The magnetic flux lines are bundled on the small circular surface (13 mm), and therefore the magnets possess a high adhesive force (almost 9 kg!). The base area has a diameter of 25 mm. The north pole is located on the small circular surface. Due to the impressive adhesive force of over 8 kg, cone magnets are hard to separate. Your best chance is to move them sideways to avoid pinching. On the other hand, they can hold up to 35 A4 sheets on a whiteboard with no problem.